Recorded at Version City Studio, produced by King Django (Stubborn All-Stars), and released on Stubborn Records (Django's label), you know The Radiation Kings are something special. After all, Version City is Django's studio; and, on top of that, he did produce and release their album. With his credibility already established through a vast resume that reads like a who's-who of modern ska, his knowledge shouldn't be challenged. 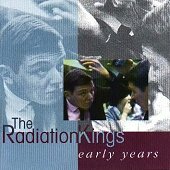 So, it came as no surprise when I popped in EARLY YEARS by the Radiation Kings and instantly fell in love with it. "Murder" is a soulful traditional ska song that finds strong female vocals packaged over fierce, fiery dance rhythms that hit you with their subtlety rather than with all out force. And the rhythms are lethal, galloping over a wide range of influences and fusing them all into a powerhouse ska sound. Then there is the rocksteady-ska of "Gin & Tonic," a graceful cut bound to get you moving with bright, lively horns, a relaxed rhythm section, and a sliver of guitar that adds just the right spice to the mix. "Messenger," on the other hand, finds the band dabbling in some reggae as they reach deeper into their Jamaican styles and pay homage to their influences without sounding derivative or unoriginal. But it's the sweet soul and reggae combination of "Can't Find A Way," lead by beautiful female vocals, that will make you wet your pants and faint with excitement. The temperature reaches a boiling point as the soothing music and equally soothing vocals blow together to captivate and entertain. The jumpy reggae-ska of "Dem Try" and the steamy hootenanny of "This I Know" further the band's stance as an up-and-coming act to keep your eye on. To be honest, there hasn't been a lot of really good roots ska released as of late. Or, even any new roots ska acts released on a national level. After the commercial bottom fell out, the market seemed to dry up. But, the die hard fans and the true believers in the music stayed behind, and EARLY YEARS is one of the albums that hold up against the test of trends. I'll give it an A-.